This project started completely by accident, but sometimes the happiest of accidents turn out to be blessings in disguise. 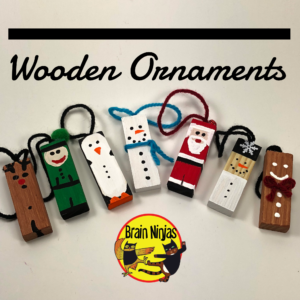 This is our path to making some wooden ornaments, but you can take a few shortcuts with our lesson below. First off, we bought a few imitation sets of the wooden block game Jenga at a local dollar store. We thought we were getting a great deal until we realized while using them in our classroom that lots of the blocks were uneven making the game rather difficult. One of our more detail oriented students pulled all the pieces that didn’t match and put them in one set-one crazy set no one ever wanted to use. Fast forward to a shopping trip in a local hardware store where there was an entire aisle of ornaments. 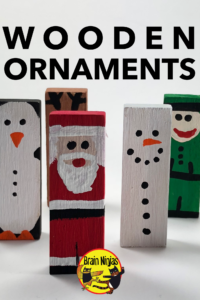 We just happened to pass a cute wooden snowmen and thought, hey-we can make that. Well it turns out we can make way more than that. We show students our idea and they went wild with ideas. Pretty much anything you can imagine, can become an ornament-to SO cheap. This makes a great student gift they can make in class or if you want to have all the fun, you can make them for your students. Paint the blocks. We found the liquid Tempera paint dried very quickly, so we were able to paint one side at a time and let each side dry before moving on to the next one. We allowed some of the wood grain to come through. As each colour dries, it is relatively easy to paint the next colour. Use toothpicks for small details like eyes or buttons. Add decorations that you want to use. Use a screw eyelet to attach a string for hanging or just glue the yarn/thread/string directly to the top of the block. Snowmen: Paint the block white and add details or paint the bottom half white and the top black for a hat. Add a carrot for a nose with a marker, paint or orange fabric. Santa: Paint the entire block then add a black stripe at the bottom for boots and halfway up for a belt. Put a white stripe above the black for the trim of the Santa suit. Paint a white beard and trim for the hat. Add black buttons or a silver belt buckle. You could add cotton to the beard or a pompom for the hat. Elves: Just like Santa, but for the face use a skin colour and add facial details instead of a beard. Use green or other colours instead of red. Gingerbread Man: Paint the block brown and add details. Penguin: Paint the front of the block white and the rest of the block black. Add face details. Use orange for some feet and a beak. Reindeer: Paint the whole block brown and then add details. We painted our antlers on, but you could use pipecleaners for antlers instead. Tree: Paint the block green and the decorate it like it’s a tree. This makes a great project in December, so have fun. We’d love to see what your students create so please tag us on social media! Leave your thoughts and ideas below.